At fourteen months, the twins aren’t yet walking enough to go anywhere without a stroller, especially if only one of us is taking them. It’s winter and the wind is gusting to 35mph today, so the cover is on to keep their faces from turning pink. With the cover on, you can’t carry anything in the box that would otherwise protrude because the cover fits on tightly. 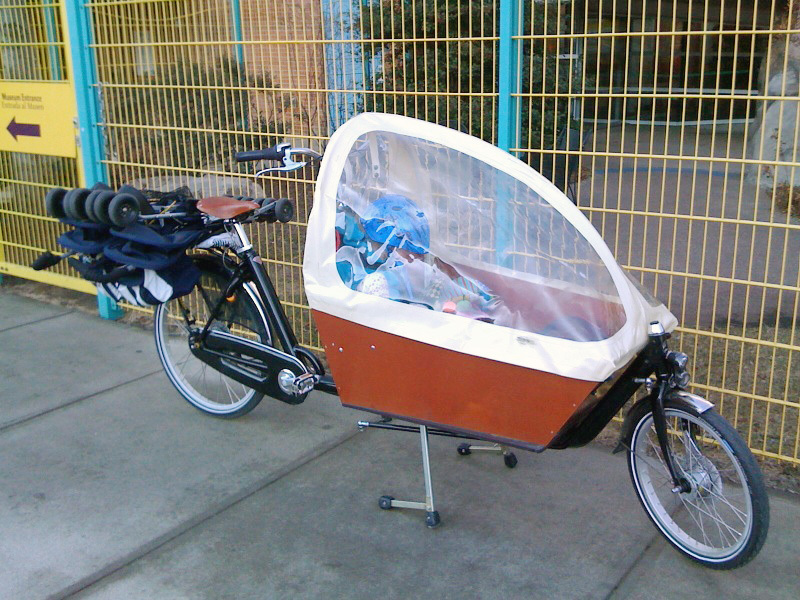 So the stroller goes on the rack. The rack is majorly tough. It’s not like anything you’d find on an American bike, unless its racks are Tubus or a similarly heavy-duty import (Surly probably makes a good one, come to think of it). It’s also simple and smartly designed. It has two tabs welded to its arms made to hold the hooks of a bungee cord. 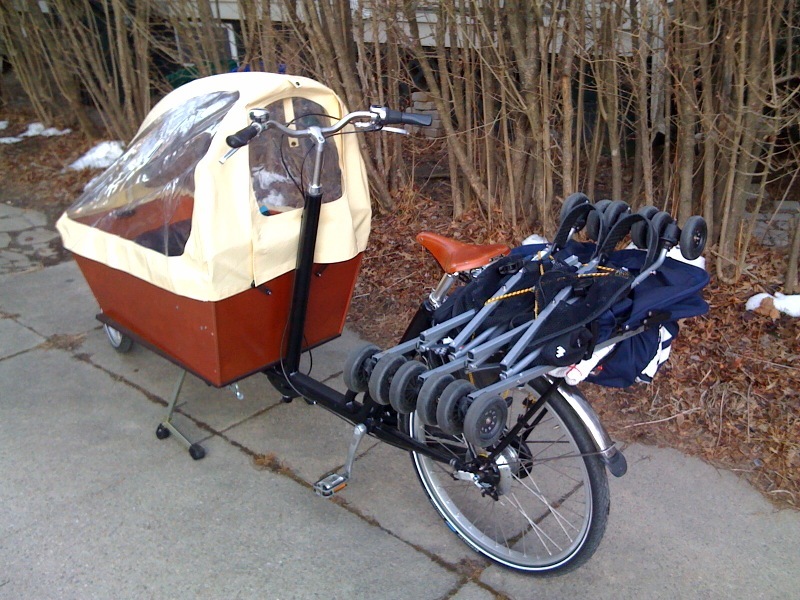 (They’re squared off to fit exactly to a standard Dutch elastic, which comes with the bike, but they do just fine with a bungee hook). When I put a bungee on the aftermarket rack on my Raleigh, I have to hunt around for the best curve to hook onto and hope it doesn’t slip on the ride. 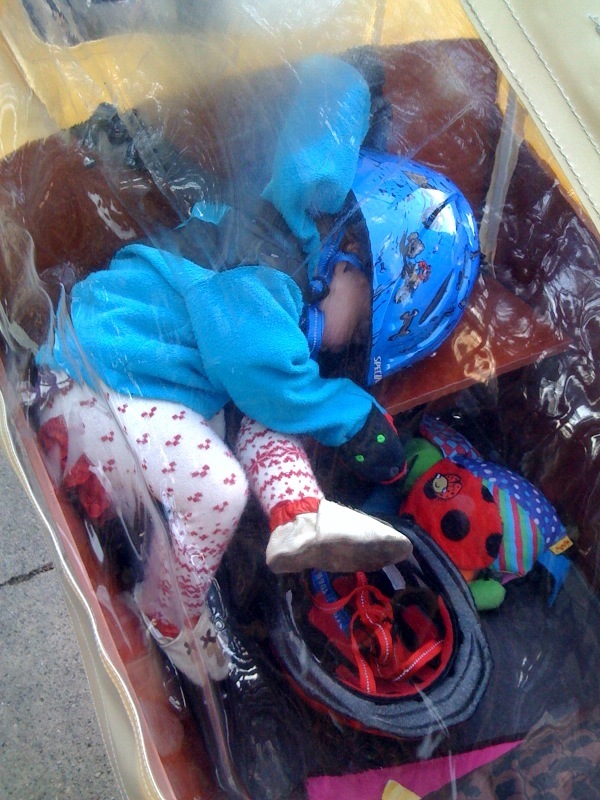 With the bakfiets rack, I don’t have to think. The hooks go under the tabs and the load has all the room it needs to balance, no matter how unwieldy.